As someone who has frequented traffic courts over the years, I can attest that it’s no pleasant experience to wait your turn for a little brow beating at the hands of a Municipal Court, Traffic Division judge at Downtown’s Metropolitan Courthouse. After they scare you into a guilty plea then hit you with a fine, penalty assessment, and traffic school fees, there’s little left for a guilt-free lunch. 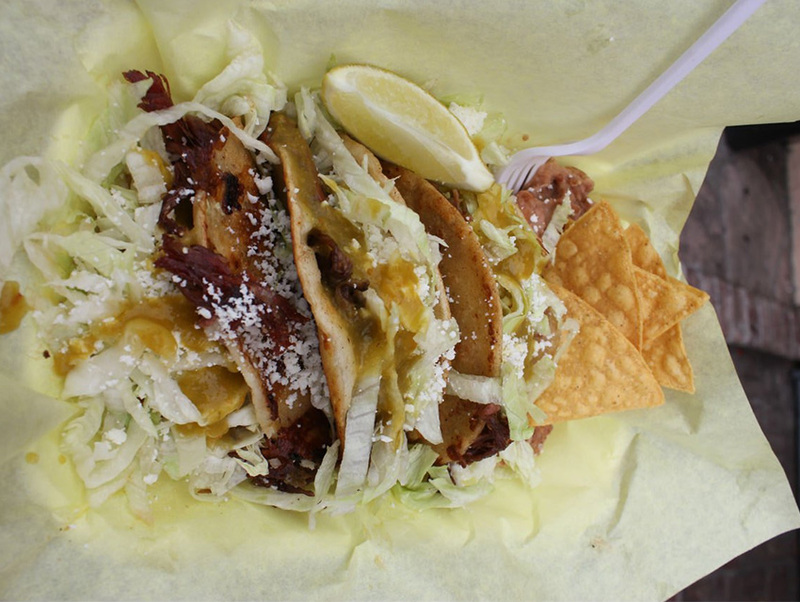 Unless you consider El Rey de la Barbacoa, a food truck located on the west side of Hill St., between W. Adams and 27th. El Rey de la Barbacoa is one of the the several state of Mexico lamb barbacoa spots located on Adams, between Hill St. and Stanford Ave. That includes a backyard restaurant specializing in Capulhuac-style barbacoa, where most of the neighborhood’s vendors are from, with the exception of El Rey. Capulhuac lies just to the southeast of the capitol of the State of Mexico, Toluca, both which are famous for their brand of pit roasted lamb. El Rey has prime barbacoa, offering unique variations on lamb ribs, pansita (offal stuffed lamb stomach), and deep fried lamb tacos. A trio of messy deep-fried lamb tacos, or tacos dorados, comes with a toss of shredded lettuce, cotija cheese and a tangy salsa verde. It’s a tasty diversion from the tedium and indignities of traffic court; ask the judge for an extension, just so you can come back on another occasion for another round of fried lamb tacos.